At the very beginning of this blog, at the end of 7th Edition, I wrote ‘Requiem for an Edition’, a statistical look at the Las Vegas Open. It proved to be a popular post, and I think it’s time to revisit that concept after taking a break from it for awhile. Given the LVO has just come and gone, and the fallout from it has not yet fully settled, lets take another look. Data: The data used for this analysis is the publicly available results from the LVO, and nothing more than that. I’ve reached out to the guys at Frontline, and they’ve said they’ll do what they can to get me more data for a more in-depth analysis, but even with just the raw results, there’s things to be learned. And while this is but a single tournament, 295 data points is actually a decently respectable sized data set. Regrettably though, the data set is not quite as rich as the one I used for Requiem, so there is, for example, no examination of the role allies play in all this – all I have to go by is the primary detachment. There is, no surprise, a huge number of Space Marine and Eldar armies – 45 and 42 armies for each. There’s a good representation of another cluster of armies, but they’re all decidedly lesser players – Tau at 22, Orks at 18, Chaos Daemons at 20 and Necrons at 21. From there it goes down, to a few lonely players rocking Inquisitorial, Skitarii and Harlequin armies. 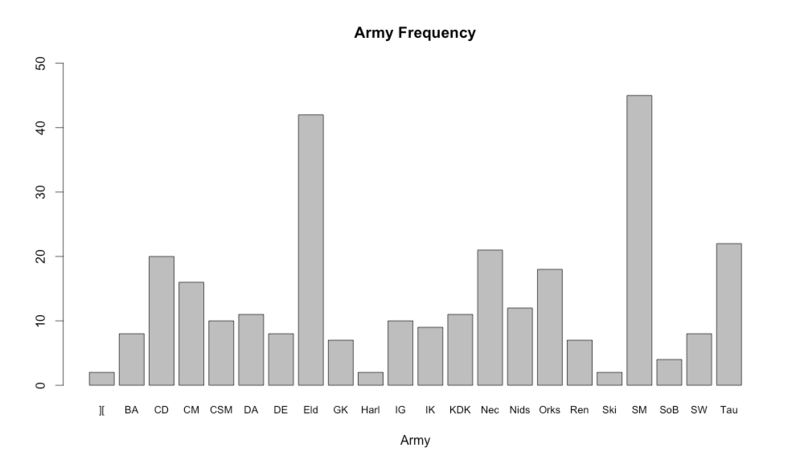 Not surprising, as none of these are really armies in the strictest sense of the word, and you likely see most of them reflected in other armies with another faction as primary. At the end of last edition, Space Marines were 17.1% of the armies played, and Eldar or Eldar/Dark Eldar were 13%. This year? 15.3% and 14.2% respectively. While these armies are extremely competitive (as we’ll discuss in a moment), there’s not actually meaningfully more of them than there were in years past. First, lets get this out of the way: An Eldar army won, and an Eldar army game in second. That is not inherently significant in its own right – we have to look at populations, but it’s strong indicator that they’re doing quite well. And, as an aside, I’m rather pleased with myself for calling that we’d see Pale Courts armies because of the utter lack of unit taxes in those formations before I actually looked at the winning list. Let me savor my triumph – that’s as close as I’m getting to ever winning a tournament. Because of the changes in the way ITC does scoring, there’s a floor of 20 points on the scores, and they’re not as nicely spread over a large range as I was hoping for, but again, you work with what you have. The overall median score for the event was 30. That would put you roughly in the vicinity of 103rd place. That may seem rather dire, but in a 295 person tournament that’s very nearly in the top third. The mean is 34 points by the way, reflecting a slight skew in the data – when you see the plots, you can see they’re not even close to normally distributed. This starts to give us some more information – visually, you could probably start grouping codexes into “tiers” if you were so inclined based on this plot.. There’s a couple take-aways I get from this plot and the data, but I’m sure you all will have some others. The Blood Angels and Space Wolves, both of which have semi-obsolete codexes, are in bad shape compared to their conventional codex or Dark Angels rivals. The Thunderwolf Deathstar, or Dante, might be able to carry an above-average player to a little bit above average, but not by much. Right now if you’re playing those armies, you’re playing them for the love of the army. While we’re at it, the Dark Angels are good (a marked improvement), but the Codex is still better. Harlequins are as bad as everyone says – they’re basically a promise of below average performance. The Skitarii are close. These really aren’t full armies – they need proper tools, and to get those tools, they can’t run as a primary detachment. The Sisters of Battle are still holding their own against much more recent codexes. As I wrote in this post, they make awesome allies for Knights, and there’s other armies where they make for hilarious fun. Chaos Renegades are the new Tau. More specifically, the last time I did this, taking a Tau army was enough to basically ensure above-average performance, but there was a hard cap on how far you could go with it. The same appears to be true for Chaos Renegades. They’ll smash middle tables and RTTs, but they’re not going to take top placing. Khorne Daemonkin, while awesomely characterful, have not somehow magically fixed close combat and made it competitive. Eldar are really, really good. Not only to have the highest performance of any army at the LVO, but also I’m pretty sure to drag up the scores of a number of Dark Eldar primary armies until that codex looks, statistically, like it’s in good shape. I’m nigh positive, if/when I have access to allied factions, that the strength of that force is all Dark Eldar/Eldar allied armies. Whose Afraid of the Big Bad Tau? I hear the Tau called out a lot for being OP, for ruining the game, for being one of the codexes that must be feared and dreaded and nerfed. That’s just not born out in the data. They’re a solid army, on par with Cult Mechanicus/War Convocation, Dark Angels or Chaos Renegades, but they’re not at the big kids table – that’s held by Space Marines, Eldar, Necrons, and Daemons. Like the Chaos Renegades, they’re a mid-table stomping army, but not a contender for the top tables. Most armies are in a good place, but there are a few that are what I’d call pathologically good – the aforementioned “big kids table”, but especially the extremely prevalent Space Marines and Eldar. Chaos Daemons, while powerful, are trickier to play than those – there’s a lot of middling-poor Daemons lists, while most Eldar and Space Marine armies are enjoying above average performance. This is born out statistically – while the smaller LVO dataset from years ago didn’t really achieve statistical significance for there being more differences in the medians than you’d expect by chance, this year’s P-value is 0.0007. That’s stupidly significant – these results aren’t just the result of random variation/player skill. The armies that did well also do well grabbing bonus points. That’s not terribly surprising, save to reveal some armies that consistently don’t get much in the way of bonuses – Tyranids, Skitarii, Harlequins, Sister of Battle most terminally, but Daemonkin, Blood Angels, and Imperial Guard aren’t far behind. Renegades, again, are good at it, but not the best at it. Dialing in more than that will require more data – stay tuned. Club Players: The last time I did this, there were a couple “just for fun” analyses I did – the only one I can do in this data set is to figure out whether or not it matters if you’re in a club. It does. 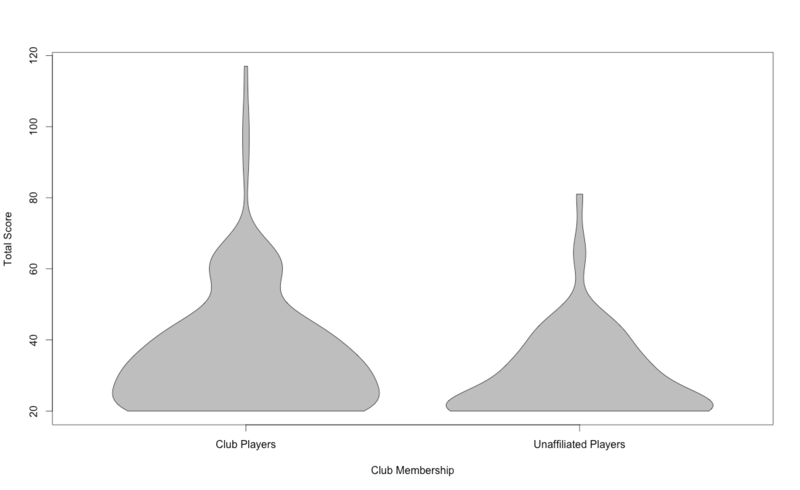 While there’s no promise that being a member of a club will help, that kind of sad, funnel looking score plot for unaffiliated players indicates they perform more poorly in tournaments. Of course, this likely has nothing to do with being in a club, but far more likely reflects anyone intending to win a GT is probably part of a club – if you put in enough effort to try to take the LVO by storm, you’re going to be playing a lot of games with people. You might as well buy t-shirts. I don’t necessarily want to break down scores by team – that feels a bit too much like calling people out. Closing Thoughts: 40K is in an interesting place. Most of the armies, barring those that are really more allied forces than true armies, are doing decently. Few are performing just consistently below average or barely squeaking by, and most of those armies have codexes that were written under the somewhat powered down, “Custom Force Org Chart” paradigm of codex design, ala Space Wolves, Orks and Grey Knights, among others. But outside a few edge cases, you can show up to a major competitive tournament with almost any army, and expect to do decently. The problem is when you ask “Yeah, but can I expect to win?” Ideally, I’d love to say that yes, pick an army, play it well, and you have a shot. But that’s simply not supported by the data. The top spots are the domain of Eldar, Space Marine, Necron and Daemon players – all others need not apply, or are at the very least facing a very uphill battle. My concern now is that we seem to have shifted paradigms again – the Tau and Space Wolves have been updated with what is essentially DLC, adding a few new units and modern “detachments of formations”, but not necessarily fixing underlying problems. It remains to be seen whether a “patch” like this can bring a underperforming army like the Space Wolves up, but at present, it hasn’t moved the Tau into contention, despite some very powerful units and formations. This is simply amazing. Thank you for this analysis! It makes my day every time. I know a lot of Tourney’s have an issue with Day 2 drops. Did they have at LVO, and have any of your numbers accounted for that? I hadn’t heard that dropout was a major problem, but beyond that being reflected in a much lower score, no, the numbers don’t account for that as, with the data I have, there’s no way of telling who dropped out. Can you please link to the data you used? I’d like to perform my own analysis, but haven’t found a good data source. Thanks! Next question, do you know what the bonus points are\how they are awarded in the format? They seem to be heavily skewed towards the top 10% of players. That will, naturally, favor top players. I think you see people complaining so much about armies like tau precisely because they are “middle table stomping armies.” Complaints come from the majority, generally, and by the nature of tournaments most people don’t make the top tables. And while these armies don’t make top tables either, they are apparently a force to be reckoned with in the arenas they do well in. I do have to wonder, though, if the progressive scoring missions that were supposed to “balance the game” don’t also have something to do with what armies we see taking the top spots. At the high peak, it’s probable that “space marines” can be read as “white scars battle company.” Eldar would probably perform well purely by dint of their mobility, even if they didn’t have such effective shooting (which I’m not disputing they have). Necrons don’t lack for good transports, as well as being able to weather a considerable amount of firepower and likely excel at progressive scoring by way of keeping more bodies on the table than most. Lastly, chaos daemons, which is what really makes me think it’s something other than just codexes that make certain armies top-table contenders. Chaos daemons didn’t have a “decurion” or even a 7th ed codex at all at the time of this tournament. 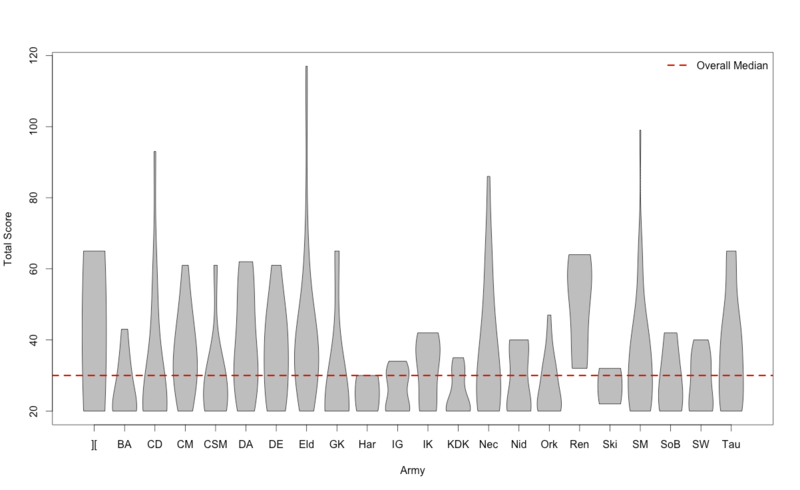 Sure, they’ve been strong performers for a while, but plenty of armies were as well off or better in the prior data set. What do daemons have? Well, aside from generally reasonably priced troops with deep strike across the board, and nicely costed mid-size options with considerable maneuverability (hounds, screamers), they also have summoning, which while not the only source of free points, allows them to maintain board presence and coverage pretty well. Just my thoughts on the new meta, I really do think some armies are just far, far better equipped than others for progressive scoring in its current form. Armies that just can’t get from point A to point B fast enough (while maintaining ability to score) such as tyranids, or who can’t cover enough of the board at once, like knights, just don’t perform well in a maelstrom metagame. The rules create little incentive to take a point and hold it, so the armies that are better at that style of play don’t have a niche. Maybe it’s time to look at missions again, because as the article said, this is a very unhealthy looking meta. I’ve found, playing Eldar, that I’m disadvantaged (relatively speaking) when playing Maelstrom-style games in comparison to more conventional objective games. That is, of course, my own personal experience. Mainly it comes down to anything that dictates where the Eldar have to move (like “Take Objective 2”) is worse for the Eldar than being able to move utterly freely. Still, I think there’s something to be said about the fact that some armies have much, much better answers to maelstrom scenarios than others. While Eldar might prefer to move as they please, it’s hard to argue that when “Take Objective 2” is a thing that comes up, they generally have the choice of whether or not to take that objective, often possibly immediately (obsec jetbikes are astoundingly good in that regard). Not all armies can redeploy that freely- consider skitarii, I think that, more than any other holes they might have, is their Achilles heel. And that’s my main point, more than “Eldar and other armies prefer maelstrom”, it’s “Some armies have much better tools for dealing with a maelstrom environment.” Above even raw firepower, I think it’s a mix of mobility and staying power that is the secret sauce that makes those armies stand out so much from the field. Why does the overall median of 30 put you in the top 1/3 instead of squarely in the middle? Is the “below average performance” for Harlequins and Skitarii really statistically significant considering they seem to have four (?) players between them? 1. Skewed distributions mean the “average” isn’t necessarily in the middle. 2. It’s probably not statistically significant – though it could be – but there’s a lot more to looking at this picture than just statistical significance. The fact that at a major tournament there *aren’t* Skitarii and Harlequin players is indicative of something, as is the fact that they didn’t do all that well. For Skitarii, at least, I think it really just reflects the fact that anyone bringing a significant Skitarii detachment is pretty strongly incentivized to just play War Convocation instead. Harlequins suffer from having a pretty mediocre and awkward “primary” detachment- their “allied” detachments are much better, which means that actual Harlequin-primary armies will be quite rare in most cases. In both cases I agree. c) And lack of superheavies. RAW, the Hunter Contingent’s combined fire addresses the first two, while the KV-128 Stormsurge addresses the last one. The ITC basically ruled out combined fire, though, so as far as they’re concerned we’re back to being a mid-tier stomper faction. Also TY for your analysis! Someone on BoLS did one of Warmahordes earlier; it’s interesting to compare the two in terms of tournament balance. This is some very good stuff and much appreciated- you’ve got some really helpful visual illustrations that take some rather tricksy statistical concepts and break them down in a pretty digestible way. I’d love to see some more of this kind of thing with other big tournaments (Adepticon, NOVA, etc) if you could manage it, but I don’t know if they give you the kind of data you need to work with. Regardless, this is exactly the kind of analysis that competitive 40K needs- data-based and rigorous. Keep up the awesome work. It’s something I’m working on though.